A conference organizer recently reached out to your Decision Science News editor (Dan Goldstein, aka me) asking if they could use the above quote in promotional materials. I doubted it was my quote. Doesn’t sound like the kind of thing I’d say. But who knows. It does relate to future self stuff, which I do talk about. Perhaps I said it after a few beers and forgot. After poking around, I figured out it’s a Dan Gilbert quote that got attributed to me, Dan Goldstein. 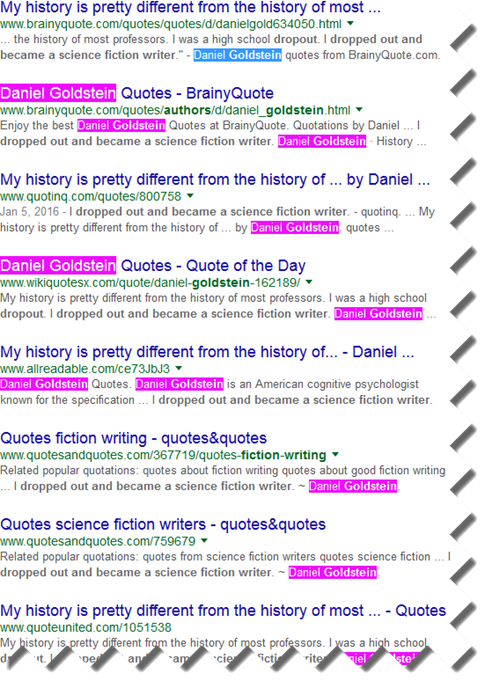 Apart from the fact that Gilbert is a far bigger shot than Goldstein, it’s a forgivable mistake. We’re both Dans. We’re even Daniel Gs. We’re both psychologists, with TED talks, who’ve researched consumer financial decision making. I even spent a semester in Gilbert’s lab. So one source mixing it up one time is forgivable. One reason I suspected this wasn’t my quote is that I’m not that good with words. Dan Gilbert, on the other hand, is great with words. Gilbert’s a guy who dropped out of high school to become a professional science fiction writer. Due to the magic of non-independent errors, the Internet mistakenly believes that I too dropped out of high school to become a science fiction writer. Coincidentally, Dan Gilbert has a paper called You can’t not believe everything you read which suggests that reading an incorrectly attributed quotation might cause you to believe the incorrect attribution. So this blog post may have messed you up. Sorry! I am going to make matters worse, by sharing it on our company page on LinkedIn! Something this wrong needs even more distribution. 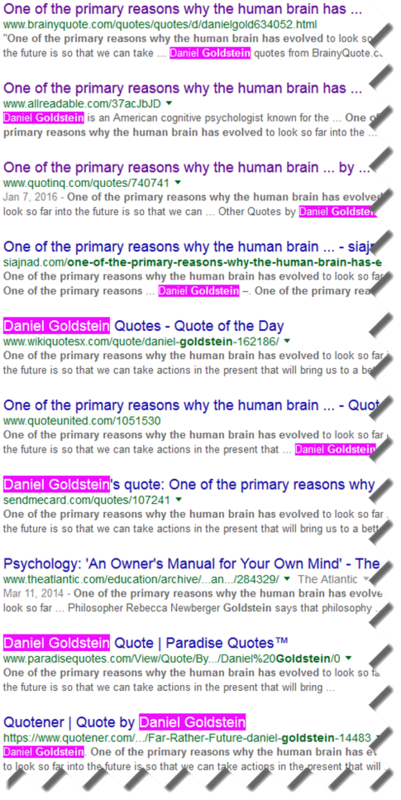 Don’t believe quotation websites was written on January 26, 2016 and filed in Gossip,Ideas.